-Drying herbs to offset the tendency of the Earth horse to build up fluids in his tissues. -Specific amino acids and minerals are included to help the build strong muscles and to improve endurance. -Digestive enzymes are provided to support proper breakdown of foods. 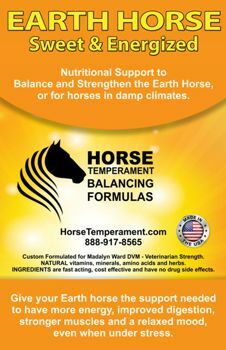 -Additional amino acids are used to support the mood of the Earth horse to help him be more ambitious and less inclined to worry.